In my time as a Business Intelligence consultant and trainer I have picked up some pretty cool tricks and thought I would start blogging on these tips two or three times a week as I catch myself using them. 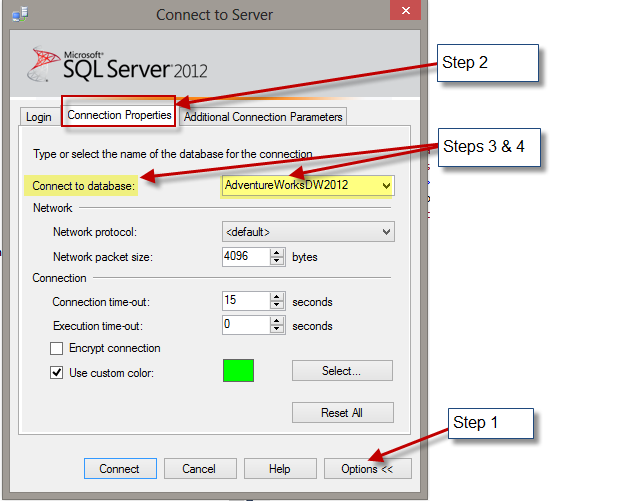 In this blog I am going to show you how you can set your default database when you connect to a server. I find this to be an extremely helpful little tip. Please see below. Open SSMS and from the object explorer click “Connect”. From the Connect to Server prompt: Enter your server and Authentication information. Click “Options”, located at the bottom right. Next click the “Connection Properties” tab found at the top. Locate “Connect to Database” and then click the drop down menu. From the dropdown menu select <Browse> and then select the database that you want to be your default. Click Connect..
Voila! Now every time you connect to that server it will default to that database instead of master!